Red paper lanterns, or aka-chochin, are a familiar sight on the city streets of Japan, where they typically hang at the entrances to cheap pubs, capturing the attention of passersby. 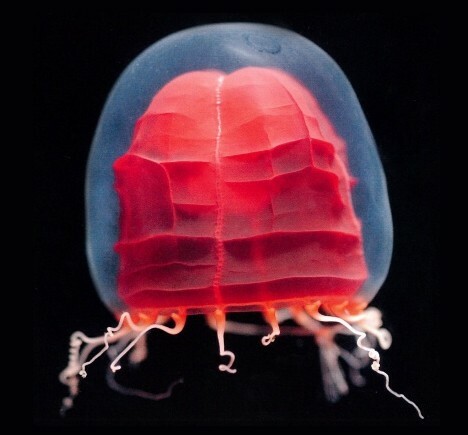 The ocean, however, is home to a different variety of red paper lantern -- an unusual species of deep-sea jellyfish. 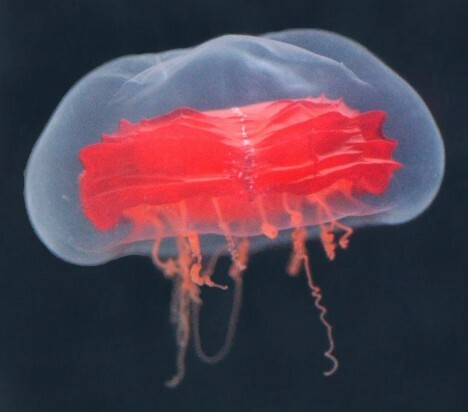 Officially named Pandea rubra, the red paper lantern medusa (aka-chochin kurage) was first discovered in the Bering Sea in 1913, but details about its distribution and life cycle have long remained a mystery. In recent years, the creature has caught the eye of researchers at the Japan Agency for Marine-Earth Science and Technology (JAMSTEC) armed with high-definition video cameras. The red paper lantern medusa has a transparent, bell-shaped hood measuring about 10 centimeters in diameter and 17 centimeters from top to bottom, with between 14 and 30 tentacles that extend up to 6 times the length of its body. Inside the transparent hood is a deep red colored mantle that can crumple up or expand like a paper lantern, hence the name. JAMSTEC researcher Dr. Dhugal Lindsay is credited with coming up with the name. The gelatinous creature is commonly found at depths of between 450 to 900 meters in warm and temperate waters around the world. Observations have been reported in the Antarctic Ocean, but never in the Arctic Ocean. The JAMSTEC videos suggest that a variety of sea creatures regard the red paper lantern medusa as a safe place to establish temporary residence. In the video, the developing larvae of shrimp and sea spiders can be seen hitching extended rides on the jellyfish. "We didn't expect to find such a variety of organisms attached to the jellyfish," said Dr. Dhugal Lindsay. "Humans apparently are not the only ones attracted to red paper lanterns." It's a beautiful sight. Evolution is amazing in it's complexity and random beauty. Congratulations on the discovery and film footage. Im the first one to mention obvious similarity to a metroid? Wow.